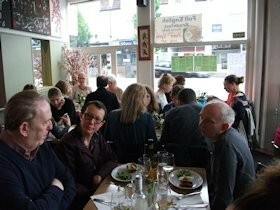 What a treat to attend the first ever Pop Up Raw Vegan Gathering on Sunday in North Kingston organised by Patricia Campbell Parker www.vitalwellbeing.net featuring raw vegan food created by Francesca Paz from Moody Mango. We were so excited because the menu was not only dairy free, but gluten free as well! 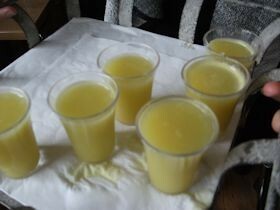 First up was a ginger shot, produced by Patricia, a delicious blend of ginger and citrus fruits. I remembered it well from Patricia’s juicing workshop I attended, since when I’ve become an avid juicer! The starter was radicchio leaves filled with peanut satay, accompanied by a yellow mango chutney. The nuts gave the dish an extra dimension. An unusual and beautifully presented dish. The main course was lasagne but not as we know it. 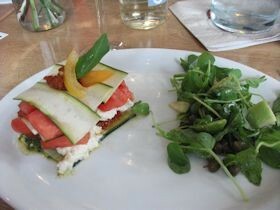 It was made from thinly sliced courgette layered with a spicy tomato sauce, ricotta, hemp pesto, tomatoes, rocket and avocado pieces. The star of the dish was the ricotta made from macadamia nuts – it not only looked like cheese, but tasted like it as well. Completely convincing. The overall taste was tantalising. I particularly enjoyed the cheese and tomato sauce. Astonishingly, none of this food was cooked and yet it tasted wonderful. In between courses, we were encouraged to mingle with people on other tables and swop business cards which was great fun. 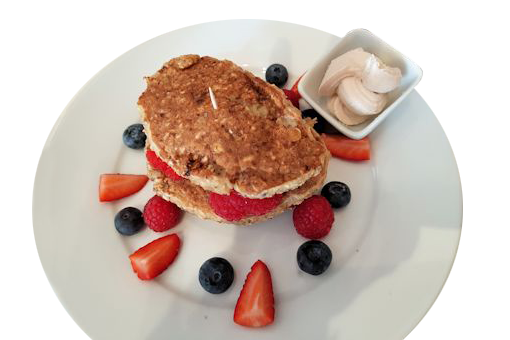 As regular readers know, Ray and I rarely have desserts – well, in most restaurants, desserts have dairy and gluten in them. But the dessert was a melt-in-the-mouth cheesecake – not only dairy free, but gluten free as well! 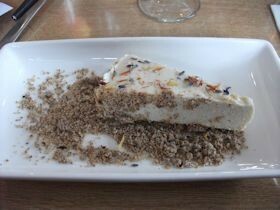 It was made from coconut and cashews topped with dehydrated citrus fruit and surrounded by hazelnut crumble. A triumph. Ray was over the moon as most dairy free cheesecakes we’ve tried have tasted bland, but this was the best we’ve eaten. To finish off, Patricia served everyone a glass of her warm tonic, a blend of coconut and turmeric to settle the digestion. Delicious. Congratulations Patricia and Francesca – I’m sure this will be the first of many. Keep up the good work.